Roy's challenge at Mindful Creations goes up every Thursday. This week he's challenging us to use the tangle Knightsbridge an official Zentangle. This is one of the basic tangles that you learn when you start tangling. There are lots of variations that can be done with this tangle as you can see if you click over and take a tour of the other entrants blogs. I started with a basic string and filled in the spaces. Basic, Basic, Basic. Nothing fancy. 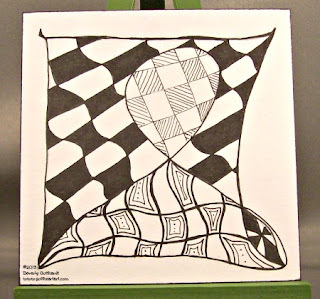 This would be a good time to give Zentangle a try if these little squares of goodness look fun to you. Maybe nothing 'fancy', but pleasant to look at. Lovely tile! I like the way you arranged the variations of “Knightbridge”.